Onboard Systems International, Inc., a leading provider of innovative helicopter cargo hook equipment, announced the production release of its next generation TALON MC Keeperless 6,000 LB (2,722 KG) cargo hook, which includes additional safety-oriented and user-friendly features. The updated TALON MC Keeperless cargo hook includes a new, highly-visible manual release lever on the side plate, below the bumper ring. The addition of a lever in an accessible location will make it easier for the ground crew to open the hook during loading and unloading operations. 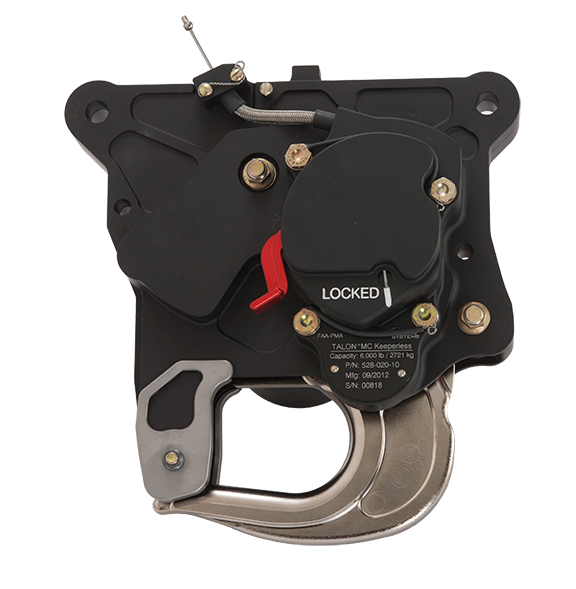 The hook lock indicator has also been redesigned to make it easier for the ground crew to quickly verify that the hook is securely locked after loading. Onboard Systems International, Inc. designs and manufactures a complete line of innovative helicopter cargo hook equipment under its TALON® brand, including belly hooks, cargo hook suspension systems, onboard weighing systems and remote hooks. Its low-weight, high quality products provide helicopter operators with increased cost efficiencies and safety through customer-driven designs, responsive service and support, and low on-going maintenance costs. Founded in 1975, Onboard Systems is a privately held US corporation located in Vancouver, Washington, with an international sales office in the UK.